Rock climbing is one of many outdoor activities you can enjoy in the Roanoke Valley in Virginia&apos;s Blue Ridge Mountains. The region even offers opportunities for climbing without being outside. With all the changes in elevation and accessible Blue Ridge Mountains, there are numerous options for finding spots to go on a climbing adventure as part of your Blue Ridge Day. 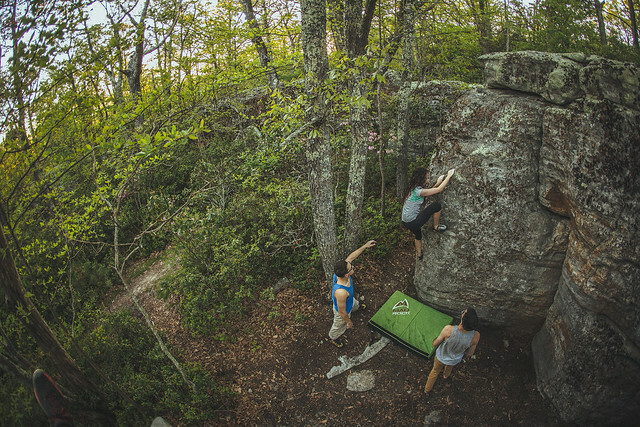 Whether you&apos;re looking for traditional rock climbing in the outdoors, the growing activity of bouldering, or an incredible climbing gym, all those activities are available in the Roanoke Valley. If you&apos;re unfamiliar with bouldering, it&apos;s generally described as a form of climbing that involves no rope and the climb typically doesn&apos;t involve routes of more than 15 feet. 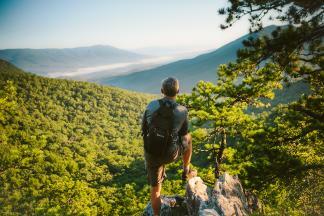 Along with being a part of the Appalachian Trail and one of the most photographed spots in Virginia&apos;s Blue Ridge, McAfee Knob is a hiking trail that offers some spots for bouldering. Learn more in this fantastic, detailed guide of bouldering on McAfee Knob. You can also challenge yourself with the rock climbing available on the Dragon&apos;s Tooth Trail and at Hanging Rock in Roanoke County. Book a guided climbing trip through Granite Arches Climbing Guides, which provide the expertise of a climbing guide, the necessary tools and equipment, and the knowledge of fun spots for a climbing adventure in Virginia&apos;s Blue Ridge. For a great indoor climbing experience, The River Rock is an indoor climbing wall that provides the perfect opportunity to become a seasoned climber any time of year. With over 8,000 square feet of climbing and bouldering and routes that are changed regularly, there&apos;s always something new to enjoy at The River Rock. There are also numerous ropes and climbing courses available at facilities that offer team-building activities in Virginia&apos;s Blue Ridge. Need some supplies to plan your climbing adventure? Visit one of the region&apos;s outdoor outfitters like Outdoor Trails and Walkabout Outfitter to get everything you need. The following is a list of popular climbing spots in the Roanoke Valley.